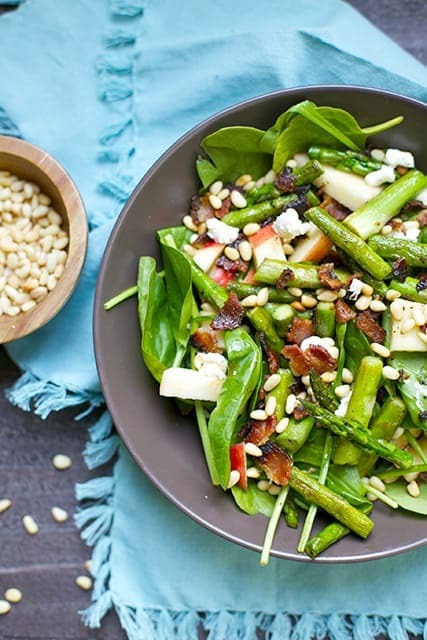 You’ll love this delicious spring salad with roasted asparagus, crumbled bacon, pine nuts, all dressed with a warm bacon dressing! 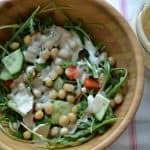 So many different textures and tastes, this salad is perfect for entertaining or special occasions! 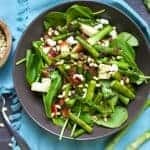 Whether you need a good side dish for a spring time brunch or Easter, or even a fun side dish for a weeknight meal, you’ll love this salad! 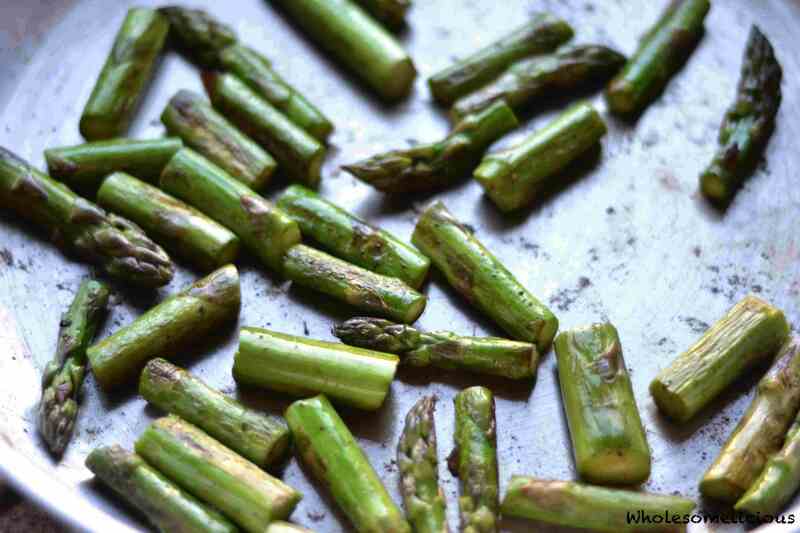 April is the month where Asparagus is in its peak season, and it just so happens to be one of my favorite vegetables! When I lived in Germany it didn’t taste that great in the off season (if you can even find it), but it was also almost double the price. So I always looked forward to April every year when it is in abundance. I have made this salad many times for Easter, as it warrants a special occasion. 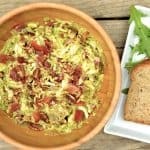 Warm bacon dressing is a holiday treat for us, and not something I make often. If you have non-vegetable eating family members, this might get them to chow down. 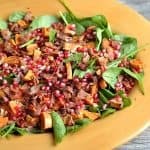 I love this salad because its hearty enough to be a full meal, or satisfies those large appetites (I’m looking at you husband) as a filling side dish. To start, I cut the asparagus in 1-2 inch pieces.As I was chopping, I heated up 4 pieces of bacon on the skillet. Once the bacon was nice and crisp, I poured the bacon fat into a small saucepan (about 2-3 tablespoons. No need to clean the pan. It was used to saute the asparagus. The asparagus roasted for around 10 minutes until it was crispy and beautifully colored like the picture. While the asparagus was roasting, I turned on the heat of the saucepan with the bacon fat. I added some red wine vinegar, a little Dijon mustard, and honey. 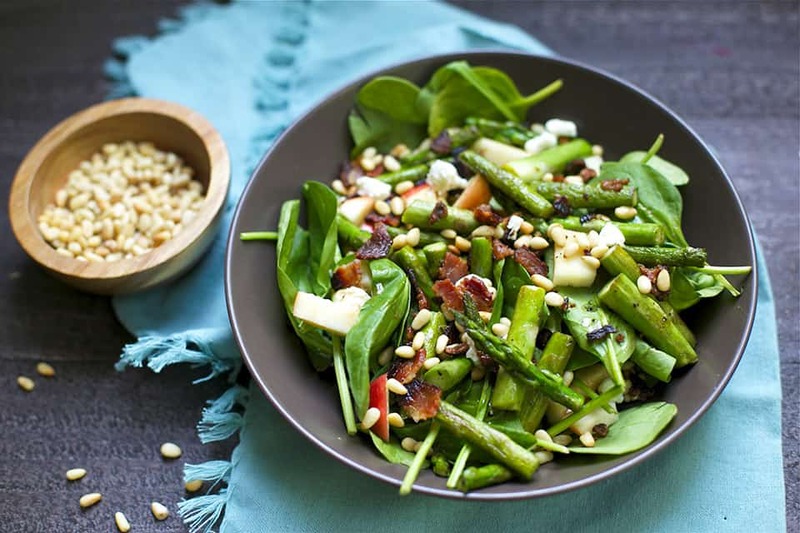 I set up a large plate with some fresh spinach, added the roasted asparagus, chopped up the bacon and added on top, crumbled a bit of goat cheese, added some pine nuts, and finally finished it off by drizzling the warm dressing. Delicious!! Transfer bacon to plate to cool, drain approximately 3 tbsp bacon fat into a small saucepan. Do not clean the fat from the large pan! Add the asparagus to the warm pan and saute for 8-10 minutes. Meanwhile, place baby spinach onto a platter or bowl. Heat up the small saucepan with the bacon grease over med heat, add vinegar, Dijon, and honey. Whisk until smooth, and reduce heat but keep the dressing warm. 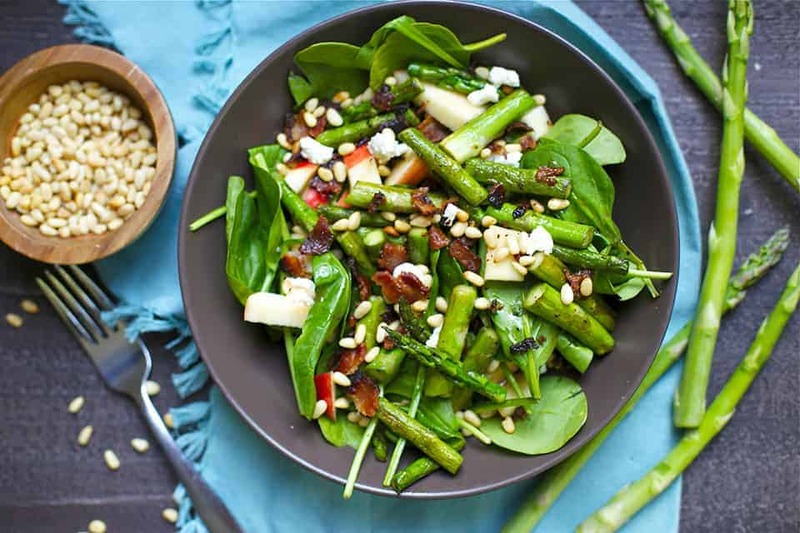 Add asparagus to the spinach once it's finished cooking, then top with apple. Crumble bacon and goat cheese (if using), and add to salad. 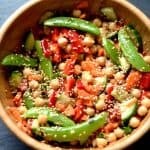 Complete the salad by drizzling the warm dressing.